It is an honor to be here today, among such great people. My religion teaches me that to save a life is like saving all of humanity. You have been trying to save and have saved hundreds of thousands of innocent lives. You are God's mercy in a sometimes unmerciful world where the poor and the meek and the disposed- the most vulnerable among our species- are targeted and exploited. Today Islam and Muslims in America are under a well planned and sustained attack by extremists who would like nothing better than to keep America polarized so that they can wield power. Today Islam is also threatened from within by a miniscule minority who are attempting to hijack the religion of peace justice and salvation to use as an excuse for their violently inhumane methods of political struggle. Today it is not easy to be Muslim, especially for women and children in America. Women who wear the hijab are especially vulnerable. Every day we hear of attacks on mosques and Muslims. Everyday our children are bullied in schools and our members are discriminated against at work. We all know what is going on in the name of stopping Muslim Americans from practicing their religion in Lower Manhattan not far from the African burial ground where Muslim slaves who built America are buried. From Huntington, Long Island to Staten Island mosques are being attacked. The fact that hatred against Muslims has risen sharply in the last few years, and not immediately after 911, proves that this hatred is manufactured in the dark recesses of evil minds working out of well furnished offices and then spread using mass media. Most of the followers of hate are good people who are duped by the manufacturers of hate. In 3 minutes I cannot even start to scratch the surface of the fast accumulating evidence of daily discrimination against Muslims. I invite you to visit the websites of Muslim civil rights organizations. What I would rather focus is that everyday good Americans like you are standing up and saying enough is enough. Who proclaim everyday from pulpits and media microphones and blogs and street corners that depriving Muslim Americans of their rights will weaken America, denying fundamental rights of Muslim Americans will lead to the destruction of the constitution and of the rule of law. Fighting against Islamophobia is fighting for the soul of America and many of my fellow citizens are joining this fight everyday. I witness this in my Islamic Center in Westbury Long Island, where I give classes on Islam. Every week groups of students and grownups visit the mosque to know about Islam first hand and go back with the understanding as to why, in spite of all this fear-mongering Islam is one of the fastest growing religions of America. The evangelical extremists call me evil, the neocons call me a threat to America- do I look evil and threatening to you? Mr politician- who has sold his soul to win a few votes- do I LOOK EVIL and THREATENING to You? Do my children look evil and threatening to you? Muslims from Morocco and Spain came to the Americas before Columbus. Muslim slaves built this nation. Muslim doctors, pharmacists, scientists, engineers, technologists, entrepreneurs, small business people, police officers, military personal, sportsmen- they are contributing to the progress, prosperity and security. They are paying for the medicare and social security for the parents and grandparents of the hate-mongers. In this town was based the man who won the admiration of Mandella and million more less known freedom fighters. Yes Malcolm X - Malik Shabbazz- lived not far from here. Not far from here, at the Madison Square Garden, Ali fought Frazier in the "Fight of the century' and in the same arena a decade after Kareem Abdul Jabbar's retirement, Hakeem Olajuwon gave lessons in Basket ball to Shaqueil O'Neil on how to play in the NBA finals. And in this town are thousands of Muslim doctors and cabdrivers serving you. And in this town, on that terrible day, in September, nine years ago, when my country was attacked, Muslims died and were burnt to ashes; and their ashes mixed with those of non-Muslims. And the Muslim place of worship- the musalla- was destroyed along with the tower that housed it. On that bright fall day that was turned dark and gray, by human malice, Muslim first responders joined their brave colleagues to offer the ultimate sacrifice so that others could live. On that day from Australia and Japan and Indonesia in the East to Vancouver Canada and the Pacific coast of Chile in the west- Muslims stood with us Americans in mourning and solidarity. I thank you that you are standing up for me and my children and my community and my country- the country that I chose to call home because of its freedom. I pledge to stand with you to safeguard those freedoms. I pledge to stand with you to make sure that women and children living in other places can be free too- free of tyranny, free of exploitation, free of war. I also thank the visionary leaders of my coalition- the Muslim Peace Coalition- for taking up this vital task and for joining in this noble struggle. They have rightly decided that to fight hatred they must follow the Islamic way of educating and informing the minds, of winning over the hearts by being actively compassionate and by fighting for social justice. They know that they can be more effective by joining hands and hearts with like-minded activists. I am thankful to Allah, the God who created all and loves all, for the hope that you the most noble of my brothers and sisters have gathered to offer me. I am here to say you are the true patriots - you are amongst the best of humanity for you stand for justice and peace and hope. Why These are opportunities for Muslim activists to meet and connect with grassroots leaders of peace movement, become a member of different committees. Please come and bring others. Standing with those who stand with us! 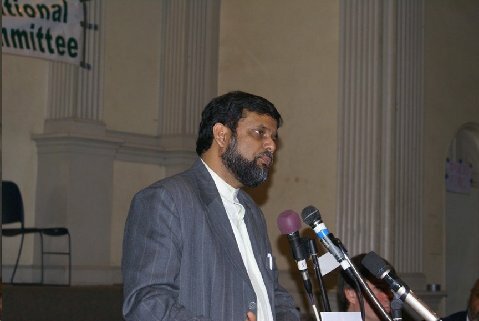 Dr Shaik M. Ubaid is co-coordinator of New York chapter of Muslim Peace Coalition, USA. It is my distinct honor to be here today with the leaders of the peace movement and to be co-chairing such an important session which will be addressed by such distinguished panelists. We gather at a critical time in our history, when the nation is a house divided and the world is threatened by wars, impending wars, cataclysmic climate changes and economic meltdown. While other panels today will deal with wars outside the shores of this nation, this particular one will address the issue of the wars that are being waged within- on Muslims ---on immigrants --on unions and on peace activists, among others. 2010 is the first year when more non-white than white babies were born in America... and this trend will only accelerate, thereby accentuating and exacerbating the fears of many. The economic insecurity of our times adds to this demographic insecurity. Such a climate offers hope to hate-peddlers and fear-pushers. Thus there is no end in sight to the fear mongering about immigrants, especially Hispanic immigrants. We saw it so vividly in Nevada and Arizona. A recent UN report has concluded that Israeli settlements in the West Bank have reached a point of no return. The settlers, in order to keep Israel a Jewish state, will have no choice but to initiate the implementation of their long-cherished dream of ethnic cleansing. Their supporters in the US therefore will continue to consider American Muslims to be a potential threat. The extremist segments of evangelists will not adopt the teachings of Jesus and start loving their Muslim fellow citizens. So the manufacture of hatred against Islam will continue. For the fear-mongers, the only good Muslim will continue to be a former-Muslim-- not even a dead one. Muslims are in a much worse shape than their predecessors- the Irish and Italian Catholics and Jews as the Catholics and Jews, though reviled, were not feared as much as the Muslims. Fear is an almost primordial emotion. It can evoke the survival instinct in the most docile of men and turn them into fear-crazed violent mobs armed with bullets or ballots. Our history teaches us that when native Americans were demonized as savages and African Americans were dehumanized as sub-humans we committed the worst of atrocities on the grandest of scale without suffering even the mildest of guilt-pangs. We saw what demonization did to the European Jews and Gypsies, how the Bosnian women were gang-raped in thousands in our own era and how in Gujarat -the land where Gandhi was born- vegetarian mobs gleefully cut open the bellies of pregnant Muslim women , fully confident that in post 9 11 months, the world will not mind at all if a few "Muslim baby snakes' lives were snuffed out even before they could breathe. So we must not take fear-mongers and hate-peddlers lightly. We must identify and expose them. We must marginalize them economically, we must boycott them socially. We must defeat them politically. But, we ourselves, should not succumb to the same evil. The great majority of Tea Party movement are good people- they are scared -yes, they are worried -yes, but they are not bad. A great majority of followers of hate-mongers in America do so because of ignorance and economic insecurity. If we reach out to them, if we embrace them, if we offer them positive solutions, then we can convert them to an ummah of love from the community of fear. But for us to do so effectively we must unite as we are doing now, we must pool our resources and our expertise and our resolve. Take a look at the hate mongers. They are a diverse group united in hatred. Just visit the hate sites on the web and look at the names and affiliations. To the ranks of extremist Jews, extremist Christians- Catholic and Protestants, extremist Muslims, extremist atheists, have joined the extremist Hindus--- who killed Gandhi and perpetrated the Gujarat pogroms of 2002. We must build a broad-based peace and justice movement- gathering peace lovers from all faith-based communities as well as non-faith based ones- all united to uphold, justice, liberty, freedom and peace. How to do that - let us start from our panels and take it to the committee meetings and then beyond. Let the historian of the future write that, just when the dark clouds of death and despair had gathered in all their might, just when the false gods of war were about to uncork their champagne bottles filled with the blood of the poor-- just when the poor shores of the world were about to get submerged by the rising oceans - the upholders of truth and justice and common sense and farsightedness rose to ward them off, and ushered in an era of peace for America and for the world. The children of Tea Partiers were not devoured by the hate- monsters created by the rightwing extremist media. The future generations of humanity did not drown on the poor shores of Bangladesh and Haiti. All the victims of breast and colon cancer were able to get the best treatment. Let the world remember not the night of November the 2nd but the fateful afternoon 4 days later. We the peace soldiers may be battered but we are not broken--Let this southern point of Manhattan not far from the hallowed grounds of ground zero, be our Valley Forge. Let us do it for our coming generations and for Peace and justice. Let us do it for America and for the world.